As Roman power in the West was disintegrating, Germanic groups began crossing the Rhine and Danube Rivers, settling in territory once exclusively Roman. Groups such as the Vandals and the Visigoths, settled in the Iberian Peninsula and North Africa, detaching forever two of the most important areas of the Western Roman Empire. Gaul, too, was not immune, and by the time the Franks moved into the region in the mid-fifth century, that province had already been subject to warfare and depredation for several decades. In 410, Britannia was lost, and it was not until almost a century later that organized contact between the island and continental Europe was re-established with the coming of the Christian missionary, St. Augustine. In 476, the Scirian general Odoacer deposed the last western Roman emperor, Romulus Augustulus, and established himself as the first king of Italy, a position he held until 493, when the Ostrogothic general Theoderic deposed him. Between 493 and 535, the Ostrogoths maintained their control over Italy. By this time, however, the Byzantine Empire under Justinian I felt militarily strong enough to reconquer those western territories of the former Roman Empire. Under the command of Belisarius, the Byzantines retook Sicily in 535, Naples and Rome the following year, and Milan and Ravenna in 540. By 552, however, the back-and-forth war between the Byzantines and the Ostrogoths resulted in a power vacuum on the peninsula, and allowed the Lombards, who ruled Italy for the next two centuries, to fill the void. During this period, coinage continued to be struck. Early Germanic gold and silver issues were copies of late Roman and early Byzantine types, including solidi, tremisses, and siliquae. The Germans, however, struck their own bronze issues. Initially, these were retarifed well-worn early imperial coins. Soon, however, the Vandals began striking their own types in silver and bronze, including silver 50 and 500 denarii as well as the bronze nummus and its multiples, the 4 and 42 Nummi. The Ostrogoths also struck bronze, including 10 and 40 Nummi, which were minted at Rome. One 40 Nummi piece, struck during the brief reign of the Ostrogothic king Theodahad (534-536), features his portrait, as well as a classical Victory standing on a ship’s prow on the reverse. In the field are the letters S C (senatus consulto), a formula hearkening back to Roman imperial bronze issues, and an attempt by these early Germanic rulers to connect with and inherit the Roman past. The Franks, too, were a Germanic people who began settling in Roman territory in the fifth century. Taking over the Roman province of Gaul, the Franks were soon united under a single ruler, Clovis (Chlodwech), who was originally the chieftain of the Salian Franks. Baptized in the cathedral at Reims on Christmas Day 496, Clovis became the first Christian monarch of the Franks. Clovis and his successors are known collectively as the Merovingians, named for the their chieftain Merowech, who ruled the Franks in the mid-fifth century. The Merovingians, or “long-haired kings,” ruled much of modern-day France and Germany for the following two and a half centuries. During this period gold and silver coins were struck. Like the other Germanic peoples, early Merovingian coins were copies of Byzantine types. While some were struck in the name of the ruler, many were local civic issues, incorporating the mint name and that of the moneyer in the design. During the period of the Merovingians, contact between Britain and the Continent was re-established. This renewed contact is reflected in a British silver sceat whose design was inspired by a local Merovingian silver issue of Marseille. The Merovingians, however, were beset by succession problems and many of the later kings were little more than figureheads, while their deputies, the maiores domus, or “mayors of the palace”, became de facto rulers. In 751 the last Merovingian king was deposed by his mayor, Pépin le Bref, who succeeded him as the first Carolingian monarch. Pépin’s son Charlemagne consolidated Carolingian power in the Frankish realm and expanded it into central Europe and briefly into the Iberian Peninsula. On Christmas Day 800 he was crowned in Rome by the Pope as the first Holy Roman Emperor. One of the many reforms Charlemagne undertook was the replacing of the old Merovingian currency with a new one based on the denier, a small silver coin whose name came from the old Roman denarius. Over the next two centuries, the denier remained a popular denomination, and formed the basis of most European medieval currencies. The great popularity of the denier, however, soon created a drain on available supplies of silver. This resulted in most silver denominations becoming billon issues, and precipitated the arrival of new, thin silver foil coins known as bracteates. From the late eleventh through the early sixteenth century these bracteates continued to be struck in some areas of Central Europe. Islamic coins also played a key role in early medieval coinage. Unable to advance further into Western Europe after the battle of Tours in 732, the Muslims consolidated their political control of the Iberian Peninsula and North Africa. As with the Germanic kingdoms of early Medieval Europe, the Islamic dynasties initially imitated the existing currencies in their areas with minor modifications. These currency types, known as Arab-Sasanian and Arab-Byzantine, continued to be used in some regions for over a century, but were soon replaced in most areas by a completely new coinage based on the silver dirham. The presence of the Muslim dynasties in Iberia and their expansion into the Mediterranean shipping routes, as well as their trade along the Volga River, made Islamic coinage one of international trade. Silver dirhams circulated alongside deniers throughout Europe between the tenth and twelfth centuries. In Spain and Hungary, Islamic coinage was the model for local issues, such as the gold dobla of Alfonso VIII (1158-1214) and a bronze issue of Béla III (1172-1196). Dinars, known as bezants (from Byzantium), circulated as the only available gold currency, until the introduction of both the écu and the florin in the thirteenth century. Beginning in the thirteenth century, European coinage underwent a change with the introduction of several new denominations and the regular striking of gold coinage. 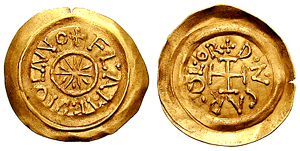 The gold florin, so-called for the denomination’s origin in Florence, was first struck in 1252. It was subsequently one of the most copied types, replacing the earlier Islamic bezant as the international gold currency. In France the gold écu was first struck in 1266, and in the Low Countries and Italy several gold denominations were also struck. In Spain, the monarchy of Castile and León continued to strike the gold dobla, and following the reconquest of the country in 1492 the excelente and double excelente, featuring the portraits of Fernando V and Isabel I, were struck. The most important silver denomination to appear during this period was the French gros tournois, first struck under Louis IX between 1266 and 1270. A large coin of good silver, it was imitated throughout Europe. Later, many states developed their own gros types: in Germany, it became the groschen; in Italy, the grosso; in Spain, the croat (later called the real); and in England, the groat. In the fifteenth century, a large silver denomination, the lira, was introducted in Italy. With the discovery of a substantial source of silver in Joachimsthal in Bohemia in 1518, a similar large denomination, the taler, was struck. Known initially as the Joachimstaler, its popularity led several other states to adopt it, with modification, as their own largest silver denomination. Either through the Dutch daalder or the Swedish daler, the United States Dollar got its name. Like the gold issues, the designs of these silver coins reflected the artistic styles of their periods, first under the influence of the Gothic style, and later, as the Renaissance approached with its reintroduction of Greco-Roman art, with a more classical style. By the sixteenth century, when the early modern period began, the developing European nations had established their own currencies, which continue to the present day. 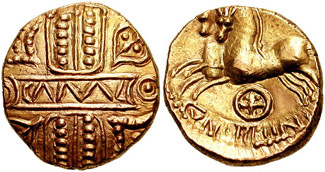 The regional Celtic tribes of Britain struck their own coins in the first century BC. Initially they copied Continental Celtic types, which themselves were imitations of royal Macedonian and Thracian issues. Each tribe struck gold staters and silver and bronze units. Even after the Romans under the emperor Claudius conquered the island, groups such as the Iceni continued to mint their own local coins. Following Boudicca’s revolt and Agricola’s subsequent campaigns in Britannia, local Celtic coinage ceased, and was replaced by Roman issues that were struck to pay the troops concentrated along the frontier. During the rebellion of Carausius and Allectus in the late third century AD, several local mints, including one at London, were opened to strike coins. Upon the recovery of the province by Constantius I, the mint at London was made an official imperial mint and continued to strike Roman coins until they abandoned Britannia in the early fifth century. Following the abandonment of the province by the Romans, Britannia underwent a period of transformation as new peoples, primarily the Anglo-Saxons, migrated across the Channel and intermarried with the local population. The earlier Romano-British people either remained to act as serfs or migrated to the coasts of Brittany and Gallaecia in Spain. The arrival of the missionary of St. Augustine in 597 re-established island contact with the continent, and during the next two centuries, the country enjoyed close economic ties with the Merovingians and Carolingians. During this period, local gold and silver denominations were struck. Known as thrymsas and sceattas, these coins were mostly based on Merovingian prototypes. In the north, the local kings of Northumbria and the bishops of York were striking their own coinage of gold thrymsas and silver sceattas (that later became base silver stycas), which continued to circulate regionally until the coming of the Danes. Sometime during the 780s Offa, king of Mercia, introduced the penny, a silver coin based on the Carolingian denier. Until the time of Edward I, the penny was virtually the only circulating English denomination. In 793, the Vikings made their raids on English soil. Over the next two and a half centuries they conducted raids throughout England, Scotland, Ireland, and the surrounding islands. Later, the raids became invasions, with the Vikings gaining footholds in East Anglia and north central England, and, by treaty with Alfred the Great, received annual tribute from the kings of Wessex. For the next thirty years, this payment of Danegeld drained the coffers of Wessex and removed many Anglo-Saxon silver pennies into Danish hoards. 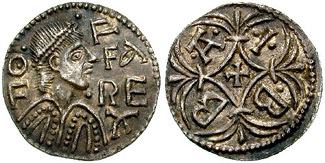 The royal portrait obverse with cross reverse, while occasionally appearing on pennies during this period, did not become a regular feature of the coinage until the reign of Eadgar of Wessex (959-975). While some modifications occurred over the next several centuries (the most radical change being that of the Commonwealth), this remained the standard design for the penny until the bronze or copper issues of the late seventeenth century. While gold coins were occasionally struck during the Anglo-Saxon period and an extremely rare 20 pence piece was minted under Henry III, it was not until the reign of Edward III (1327-1377) that gold coinage was regularly minted. The noble was issued to facilitate England’s developing wool trade. Of clear Gothic design, the coin featured the reigning monarch in the ship of state. The noble was withdrawn during the second reign of Edward IV (1471-1483) when both the ryal and the angel replaced it as the main gold denominations. The reign of Henry VII saw the introduction of the gold sovereign, a denomination that would be minted until the twentieth century. During the reign of Elizabeth I (1558-1603) a gold crown and pound were also struck, and James I (1603-1625) introduced the unite. Although special denominations were periodically added during the seventeenth century, the Tudor issues remained the standard gold denominations. During the reign of Edward I (1272-1307) the groat (or fourpence), halfpenny, and farthing were first struck. A halfgroat was added during the reign of Edward III. Henry VII and VIII introduced the testone, which was replaced by the shilling during the reign of Edward VI (1547-1553), who also was the first to strike the silver crown. By the end of the reign of Elizabeth I, the modern English denominational system was well established, remaining in place until decimalization in 1971. The coinage of Scotland began in the late Norman period, with the advent of the penny. Their silver coinage generally followed the developments in the English coinage until the reign of James III (1460-1488), who introduced a billon coinage. Thereafter, until the Union in 1707, while some of the English denominations such as the groat, testoon, and ryal were retained, the Scots developed their own silver and billon denomination system. Although a gold noble was struck under David II (1329-1371), a regular gold coinage in Scotland did not begin until the reign of Robert III (1390-1406). Unlike the silver, their gold denominations were completely independent of the English system until the accession of James VI to the English throne in 1603. In Ireland, coinage was first struck by the Vikings, who began occupying parts of the island in the 10th century. Consisting entirely of silver pennies that were mostly imitations of Anglo-Saxon types, this 'Hiberno-Norse' coinage lasted until the Anglo-Norman conquest in 1169. Thereafter, the Irish coinage was struck entirely by the English kings, and generally followed their system of denominations until the Union of 1707. The exception was that there never was a gold coinage. During the reign of Elizabeth I, British coins were minted by machine for the first time. In addition to increasing the output of coins, the process, which included stamping the coin’s edge with reeding or some other design, was developed to reduce the habit of clipping -- shaving off minute bits of metal from the irregularly-shaped edges of hammered coins. Although milled coins were minted side-by-side with hammered ones, it was not until 1662 that milled coins were regularly minted and hammered coins completely discontinued. With the restoration of Charles II to the English throne in 1660, English coinage underwent several significant changes aimed at modernizing the existing currency. The minting of only milled coinage after 1662, the revising of the various gold and silver denominations into a standardized series, the addition of bronze denominations in 1672, and the redesigning of the coinage by the engravers Thomas Simon and John Roettier along more current artistic lines, helped to create a currency suitable for England’s expanding overseas empire. During the seventeenth century England, like France, took advantage of a weakened Spanish presence in the New World to begin its own exploration and development of mercantile outposts. Beginning with Jamestown in 1607, English colonies sprang up along the eastern coast of North America. Until the English Civil War, the colonies of Virginia and Massachusetts Bay maintained a vigorous trade network funded by English currency. During the Commonwealth (1649-1660), a dramatic shortage of change forced the Massachusetts Bay Colony to begin issuing its own silver coinage. The first series was a simple silver flan with an incuse NE stamped on the obverse and an incuse value on the reverse. Later followed the so-called “Pine Tree”, “Willow” and “Oak” issues. While many of these coins are dated 1652, they were struck for a period of at least thirty years. Their continued minting after 1660, in the face of royal opposition, makes these somewhat subversive coins the first truly American issues. Nevertheless, under the later Stuarts, the flow of British issues to the colonies resumed. At the end of the seventeenth century French expansion in Europe under Louis XIV extended to her colony of Canada in North America. A series of wars broke out in America involving England, France, their colonials, as well as a number of local Indian tribes allied to either side. The French and Indian War (1754-1763) ended with the French loss of Canada (except for Québec) and British supremacy in North America, but it sowed the seeds of colonial rebellion. Though George III (1760-1820) and his advisors hoped that the new state of affairs in the colonies would mean increased revenues for the mother country and a continued economic dependence of America on Britain, the burdens placed on the American Colonies sparked a revolution whereby those states became their own united entity, retaining a debt to British culture and language, but striking its own coinage.